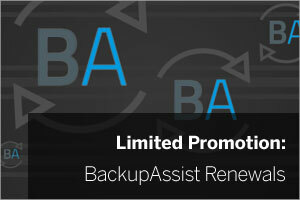 If you, or one of your customers, own a copy of BackupAssist with expired upgrade cover (you can check here), for the next four weeks, we’re offering a brilliant opportunity to bring it up to date (which also reinstates the free technical support cover). Renewing an expired licence would normally be £95.00 + VAT, but up to and including Monday 14th September, it will be available to you at the non-expired rate of £66.00 + VAT. We recently made the BackupAssist Multi-Site Manager (BAMM) free for resellers, and that only works with BA versions that have current upgrade cover so we wanted to make it easy to go back and bring them up to date. The next major version (v9.0) is just around the corner and we’d like you using it. Renewing now will cover you for all new releases for a 12 month period. Renewing means you can update to the latest version today complete with all of the latest features and enhancements (see below). What’s new in recent versions? It really couldn’t be any simpler – just add your licence to the shopping basket via the upgrade checker page and you’ll see the discount applied automatically. If you’ve got any questions, don’t hesitate to drop us a line via the live chat on our site or you can always get hold of us via the traditional methods.